The mantel is a very specific use of the down-pressure technique. It lets you use hand downpressure to permit your feet to get up onto the same hold as your hands when no useful handholds are available higher. For the classic mantel (fig. 9-9), place both hands flat on a ledge at about chest height, palms down, with the fingers of each hand pointing toward the other hand. Then raise your body up onto stiffened arms. This will be easier if you can first walk your feet a ways up the rock, or if you can spring up from a foothold. Then lift one foot up onto the ledge and stand up. Fig. 9-9. 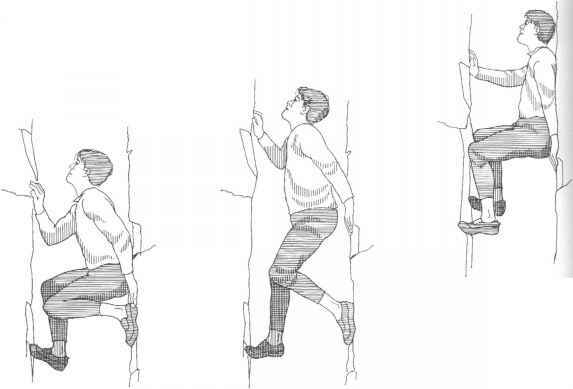 Mantel: the climber turns his hand with the fingers pointed down to make use of the natural shape of the ledge, then reaches up to use a face hold. possible, because a ledge will often be higher or smaller or steeper than you might wish. 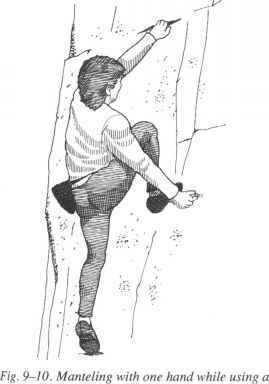 If the ledge is narrow, you may be able to use the heel of your hand, with the fingers pointed down. If the ledge is over your head, you'll use it first as a cling hold, and then convert to a downpressure hold as you move upward. 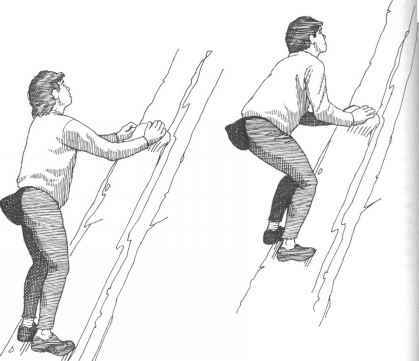 If the ledge isn't big enough for both hands, you'll mantel on just one arm while the other hand makes use of any available hold, or perhaps just balances against the rock (fig. 9-10). Don't forget to leave room for your foot. Avoid using knees on a mantel because it may be difficult to get off your knees and back on your feet, especially if the rock above is steep or overhanging. Sometimes in mid-mantel you'll be able to reach up to a handhold to help as you begin standing up. What is mantel in mountaineering?